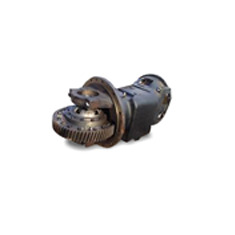 We distribute an extensive selection of FORKLIFT TRANSMISSION parts for all makes and models. We ship directly from various warehouses located all over North America to provide the fastest shipping at the most affordable prices. The Forklift Transmission is a crucial part that enables the movement of the forklift. It is a component of the engine assembly which connects both the engine and the wheels, allowing them to rotate in sync with each other. When the engine operates at varying ranges of revolutions per minute (RPM), transmission provides the conformity between the engine rotation and the wheel rotation, keeping them in balance. The main job of a transmission system, whether manual or automatic, is to let the engine operate at narrow ranges of speed while at the same time providing a wider range of output speeds. A transmission system essentially is of two types, manual transmission system and automatic transmission system. Despite the fact that many old vintage Forklift trucks have been operating on manual transmission systems, modern trucks usually rely on an automatic transmission, which adds up to the ease of operators and reduces the risk of any mishandling of materials. Where previously the operator of a forklift truck used to decide in which gear he should move the truck, an automatic transmission system had freed him/her off the worry. The primary visible difference between a manual and automatic transmission is an absence of clutch and a gear shift. The gear knob when put in drive performs all the operations of a manual transmission in an amazing way, all by itself. An automatic transmission, along with its torque converter, performs the same actions as a manual transmission coupled with the clutch. 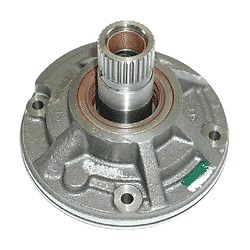 Forklift transmissions are made up of various components; the planetary gear set, torque converter and computer sensors. The planetary gear set allows the forklift to shift gears, allowing it to move forward and reverse. In contrast with a manual system where different gear sets are locked and unlocked at different times for obtaining varying gear ratios, an automatic transmission system uses the same set of gears called planetary gear system to produce all the various gear ratios. As the name suggests, the gears work like the planetary solar system, in that they are configured with the largest gear in the center with varying number of smaller gears rotating around it in an orbit-like fashion. It is almost the same size as a cantaloupe and is the only part responsible for creating all of the gear ratios which transmission can produce. All other parts facilitate the planetary gear set. A planetary gears system has three parts, the sun gear, the planet gears and the ring gear. Each of the components serve different roles at different times, any of them can be input, output or may remain stationary. 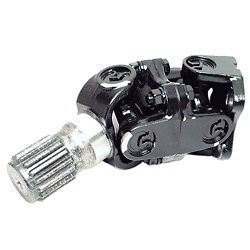 The gear system is complete with input and output shafts for manual transmission forklifts. Torque converter, a replacement of clutch in annual transmission systems, keeps the engine running despite the forklift being stationary. They are found in automatic transmissions and are composed of three parts: the stator, the pump, and the turbine. A torque converter is an example of fluid coupling, which lets the engine spin more or less independent of the transmission. This can be experienced when an automatic transmission forklift is made to halt near an obstacle, the torque converter provides less torque for engine and the forklift keeps creeping. A little pressure applied on the brake pedal is necessary to put the truck to a complete stop. The housing of torque converter is attached to engine flywheel with the help of bolts, allowing it to turn at a speed similar to that of the engine. The pump of a torque converter is one type of a centrifugal pump, which flings out the fluid with its spin. This fluid enters the turbine which is already connected to the transmission, causing it to spin and move the forklift truck. Stator is present in the center of the torque converter. It redirects the fluid coming back from turbine before it contacts the pump again. If the fluid is not stopped and is allowed to hit the pump, the engine will slow down and the power will go waste. This helps increasing the efficiency of torque in a big way. The redirection of fluid in an opposite direction is due to the way stator blades/ fins are designed. Stator has a clutch inside it, which only allows it to spin one-way, i.e in the direction opposite to the flow of fluid. During motion, transmission fluid is forced into the stator, through the turbine, by the pressure from the pump. When the forklift is not mobile, the turbine would slow down because less fluid enters. Then, the stator would get locked until the turbine speed returns. Computer sensors monitor the forklift speed, engine load, pedal position, etc. to conduct the process of gear shifting. Over time and extensive use, transmissions can be problematic. There are various indications of a transmission that needs either to be repaired or replaced. For manual transmission forklifts, if the gear does not shift or is very “sticky”, the transmission is having issues. Common causes are low levels of transmission fluids, shift cable, weak clutch linkage, or the use of a wrong transmission fluid. Burning smell or smoke puffing from the transmission indicates that either the transmission is overheating, the transmission fluid is deficient, leaking or is dirty and requires changing. While the forklift is in neutral and lots of noises can be heard, the components of the transmission may need replacement. The mechanical parts may be worn down. Forklift transmission is an essential component of the forklift’s drivability. If the transmission is having issues, it should be checked immediately by a professional mechanic. Some issues can be easy to fix such as transmission fluid leaks or lack of fluid. On the other hand, many issues are irreparable, requiring a replacement part. Solid Lift Parts Inc. provides transmission parts for a wide array of forklift makes and models. 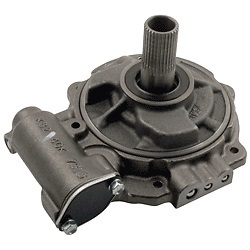 We also have remanufactured and rebuilt transmission parts available. Contact your parts specialist today for your forklift transmission parts!